We invite you to make a pledge to support our valuable work. Whether you choose to make a one-time gift, an annual gift, a bequest or legacy gift, you will help make a lasting impact on the lives of millions. Annual Gifts are a great way to support the IMC. While we will accept a gift of an amount, annual gifts generally start at $1,000. 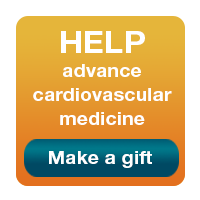 Annual giving helps build a lasting and sustainable funding source for the Institute of Molecular Cardiology. Your unrestricted annual gift helps us find answers to cardiovascular disease while providing flexibility to meet emerging needs and seize new opportunities. A charitable bequest is one of the easiest ways you can leave a lasting impact on our organization. A bequest may be made in your will or trust directing a gift to our organization. There are a multitude of ways to make a bequest or legacy gift, including charitable remainder trusts, charitable lead trusts, insurance and IRAs, to name a few. Our in-house tax attorney will work with you to create the right plan that best fits your charitable goals and your family’s need. Please check out our planned giving site for more information. We recognize that you may have multiple charitable commitments and that you may not be able to make an annual commitment now or make a bequest, so we also offer you the opportunity to make a one-time gift to support our research initiative through our secure online portal. Nonetheless, we hope that you continue to keep the Institute of Molecular Cardiology at the forefront of your mind when considering future gift plans.